In this technology-driven era, all our leisure times are spent mostly on social media and we never forget a day to charge our electronic devices. Nowadays, people hardly go out to breath-in fresh air from the green environment. 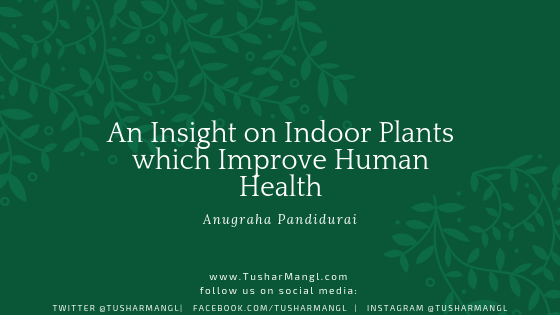 So, at least one can think about the least possible way to keep our body health by growing some indoor plants which are really beneficial to one’s health. Hence, it is time to be concerned about growing indoor plants. I hope this article will eventually help you people realize the significance of indoor plants. Aloe Vera is a traditional plant which is mainly used for skin treatment because of it’s significant curative properties. Aloe Vera gel can help with acne, sunburns and psoriasis to a certain level. Its purgative property can also cure constipation. Intake of Aloe vera juice also helps diabetic patients to reduce their blood sugar level. Our busy corporate world gives us a lot of stress to our head often leading to headache and restlessness. In order to avoid the worse conditions, one can grow Jasmine in their sleeping area. It’s sedative effect can help in attaining the state of calmness and thus eventually put people in pleasant sleep. Jasmine is also used to intensify one’s sexual desire. It also has the ability to cure hepatitis, abdominal pain and also liver pain. Tulsi which is a traditional plant has it’s native from the Indian subcontinent, contain many medicinal values and it is used in Ayurvedic and Siddha treatments. Extract from Tulsi leaves is used for strengthening the stomach and then kidney by expelling kidney stones through excretion. Tulsi root powder helps in curing diabetes. It also acts as anti-stress medicine alleviating pain due to headaches. It can heal cardiac diseases, respiratory tract infections, fever and the signs of the common cold. Intake of Tulsi also helps women with recovering from menstruation complications. Lemon balm plant extracts are mainly used in Ayurveda treatment for aromatherapy as it has the ability to reduce the anxiety level. It also helps in improving memory power (Alzheimer’s condition). Studies show that intake of Lemon balm supplements can treat various sleep disorders. The plant’s extract also helps in reducing the frequency of heart palpitations. The phytotherapy research study also shows that the extract helps in inhibiting the penetration of herpes simplex virus (which induce the cold sores). Anyhow, intake of high doses of these supplements has proven to affect the health negatively and thus these supplements are not recommended for the pregnant women, breastfeeding mothers and children. The above mentioned plants are some important indoor plants which helps in improvising one’s health and there are many other indoor plants like these with beneficial properties. So, it’s time to decide whether to live a life from sickness or not.